The Kyotronics 85 may be considered the world's first true laptop computer. It was designed and sold in Japan by Kyocera (Kyoto Ceramics). But curiously, apart from the Japanese market, it was little sold in the world despite its very innovative design. On the other hand, three major computer firms noticed this little gem and licenced it. Shortly afterwards, one would see the same computer sold under three different names and case designs in every corner of the world. These machines were the NEC PC-8201, the Tandy Model 100 and the Olivetti M10. Each brand added its own enhancement - arrow keys for the NEC, tilt display for the Olivetti, but the hardware basis was identical: an 8085 CPU, 8 to 32 KB of RAM, a full-size typewriter keyboard and an 8-line x 40-character LCD display. 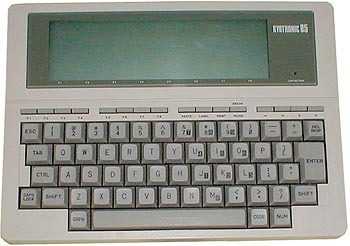 Later, Tandy asked Kyocera to introduce changes and released the Tandy 102 (larger memory) then the Tandy 200 (larger display). see more Kyocera Kyotronic 85 Ebay auctions !